On June 3rd the Scorpions will have their classic album ‘Crazy World’ reissued as a 2CD deluxe version on Universal Music. ‘Crazy World’, the band’s 11th studio album, was originally released in 1990 and contains the worldwide hit “Wind of Change”. The new deluxe package includes 12 live tracks from their ‘Live Crazy’ world tour along with ‘Crazy World’s four promotional videos. ‘Crazy World’ was the Scorpions’ first album in a decade and a half to not be produced by Dieter Dierks and is widely considered to be the last “classic” Scorpions album. 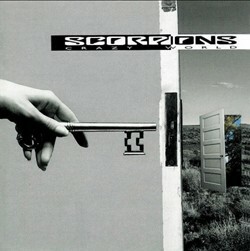 In the UK, it remains the only Scorpions album to attain certified Silver. Formed in 1965, the Scorpions are a band who have enjoyed a rich and varied history and in the process selling in excess of 150 million records worldwide. From the psychedelic leanings of debut album ‘Lonesome Crow’ in 1972 through the almost progressive era with guitarist Ulrich Roth for much of the 1970s and onto their most successful period as a more streamlined melodic hard rock band, beginning with the 1979 album ‘Lovedrive’. They strode through the 1980s as one of the biggest and most alluring of all the bands in this genre. These Germanic gargantuawatt gladiators had three Top 10 albums in the States, beginning with ‘Blackout’ in 1982, continuing on through ‘Love At First Sting’ two years later and followed by ‘Savage Amusement’ in 1988. All three were also Top 20 albums in the UK. The only other album from that period was 1980’s ‘Animal Magnetism’, which continued a commercial climb for the band that had begun with the breakthrough ‘Lovedrive’. The final album in this remarkable run of success was 1990’s ‘Crazy World’, again one of the great hard rock records of the era and ‘Crazy World’ was the last album to feature bassist Francis Buchholz, and by that extent, the last to to feature the band’s classic lineup.